Meigs came away with top honors during the first-ever TVC girls golf championship match held Monday at Athens Country Club in Athens, Ohio. Pictured, from left, are Caitlyn Cotterill, Shelbe Cochran, Shaylynn Mitchell, Lydia Edwards and Kylee Robinson. ATHENS, Ohio — A league of their own. 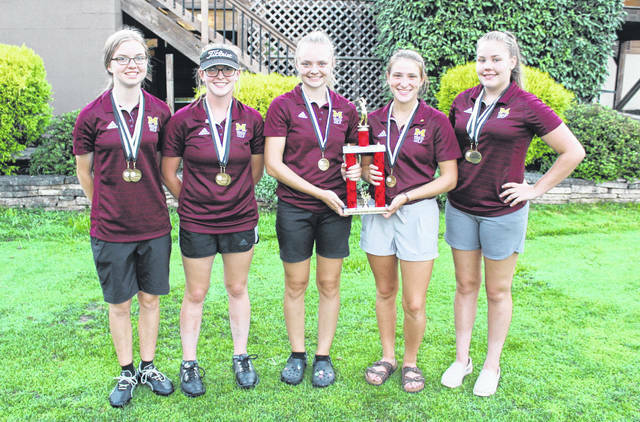 Meigs High School captured its 20th golf title in league history, but this time it was the Lady Marauders that were bringing home top honors after capturing the first-ever Tri-Valley Conference girls golf championship on Monday night at Athens Country Club. 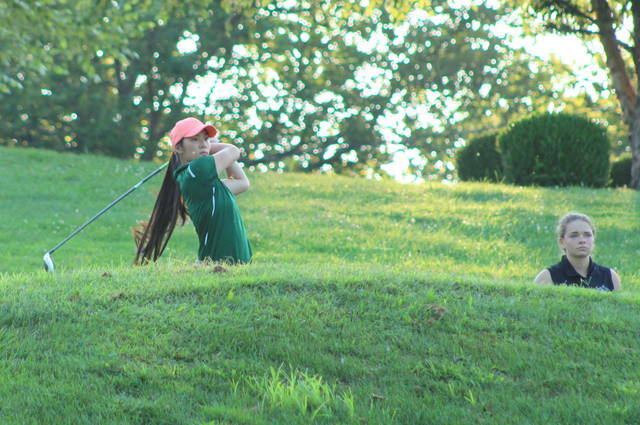 The Lady Marauders posted four of the top 11 individual scores and ultimately cruised to a 20-stroke victory in the inaugural girls title round with a final tally of 211. Waterford was the overall runner-up out of five competing teams with a 231, with Vinton County (243), Athens (247) and River Valley (271) rounding out the team spots. Both Belpre and Eastern also had individuals compete at the event, but neither program had enough entrants for a team score. Ashley Offenberger won medalist honors after shooting an impressive round of 1-over par 39 on the nine-hole course. Meigs sophomore Caitlin Cotterill was the overall runner-up with a 49. Shelbe Cochran and Kylee Robinson followed Cotterill with respective rounds of 51 and 52. Both also placed fifth and sixth individually, allowing each to earn All-TVC honors with their top-10 performances. Shaylynn Mitchell completed the winning MHS tally with a 59, while Lydia Edwards also fired a 61 for the champions. First-year MHS girls golf coach Alyssa Andrews — a former Lady Marauder golfer in her prep days — was very pleased with the girls’ preformance. More importantly, she felt that the program had taken a major step forward in its still very early stages. Chloe Gee paced the Lady Raiders with a 60, with Erika Justus and Aislynn Bostic following with respective efforts of 63 and 73. Sophia Gee wrapped things up for RVHS with a 75. Eastern’s lone entrant, senior Kylee Tolliver, tied with Andrea Bedell of Athens for third place with identical rounds of 50. Tolliver also earned All-TVC honors for her top-10 finish. Belle Lambert and Kendall Fee respectively placed seventh and ninth overall for Vinton County with rounds of 54 and 56. Alicia Dickinson of Waterford joined Lambert in a tie for seventh place with a round of 54. Madylyn Roby of Belpre completed the All-TVC list with a 10th place effort of 57.